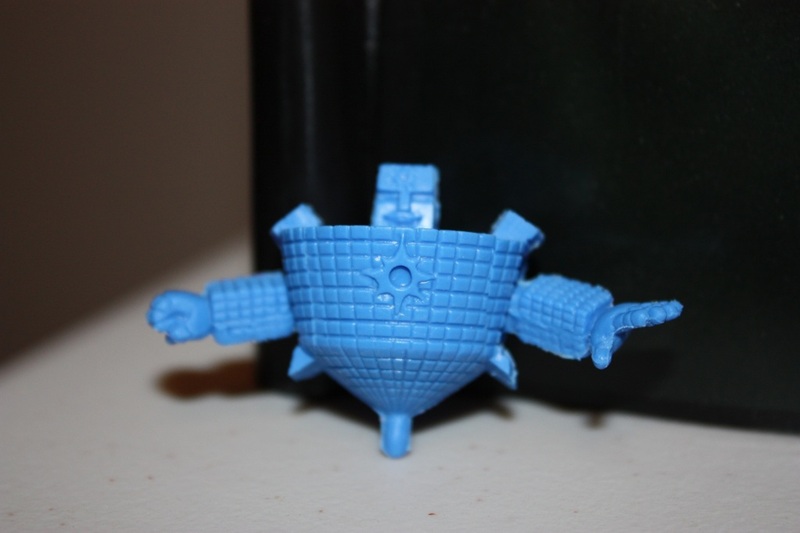 It appears that new M.U.S.C.L.E. figures do not appear in spring. It appears that the cold winter months seem to give birth to new creations. Auction Watch #55 takes a look at one of many new custom M.U.S.C.L.E. figures being offered. 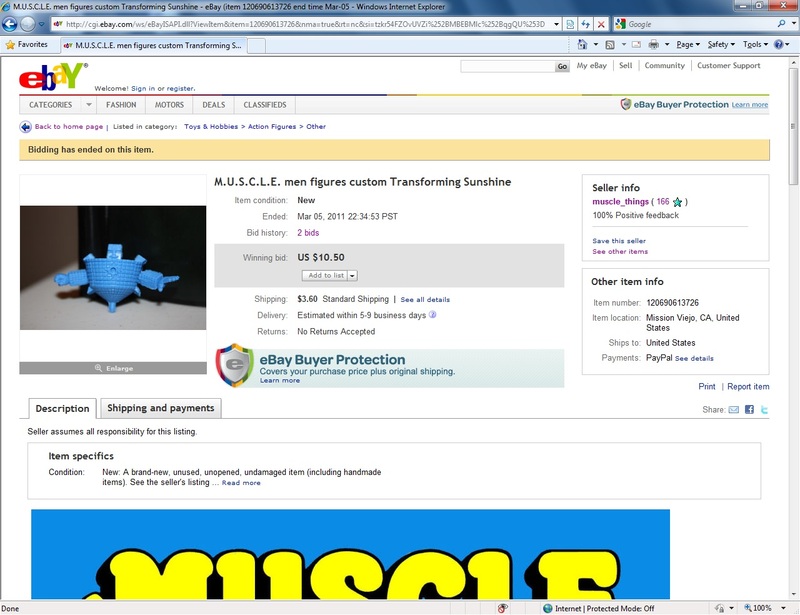 Some time ago an eBay user named woodridge first caught the attention of M.U.S.C.L.E. collectors. 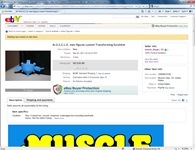 Woodridge soon became Muscle Things and now he is casting and selling a figure created by halfaway. The auction, M.U.S.C.L.E. men figures custom Transforming Sunshine, features a custom M.U.S.C.L.E. figure. It appears to be kit-bashed from a #195 and the arms of a #3. The two most attractive features of the figure are the color and the well sculpted transformation joints for the arms. The joints clearly separate the figure from a poorly constructed figure with arms simply glued onto a #195. This figure will certainly sell, for a multitude of reasons. First, and foremost, it is a great and original custom figure. 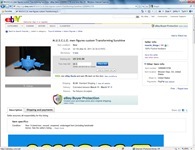 Second, both the starting bid price ($10) and the shipping price are very fair. Plus the seller, muscle_things, has perfect feedback. There are also multiple, large pictures of the figure. It might be helpful for bidders to know how closely the figure matches the original Dark Blue or the rigidity of the figure – but, ultimately, these issues are minor and do not detract from the auction or figure. 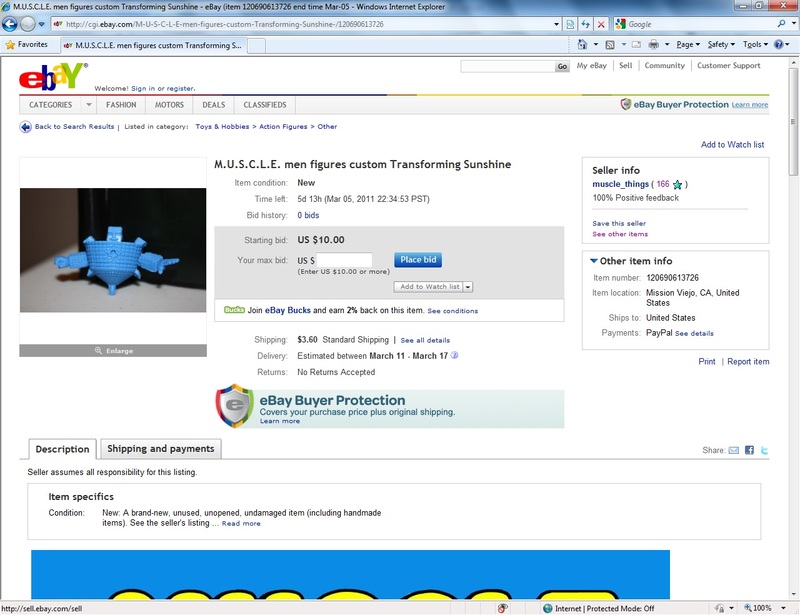 While these additional figures are all interesting and appealing, the focus of Auction Watch #55 is on the “Transforming Sunshine.” Give the uniqueness and broad appeal of the figure it seems very likely that this figure will receive a lot of attention. The final price of this auction will be $25.50. Follow-Up: The auction sold for a surprisingly low $10.50, which is $15 less than the predicted price of $25.50. In fact, all of the figures that were showcased each sold for less than $17. This entry was posted on Tuesday, March 1st, 2011 and is filed under Art, Auction Watch, UofM News. You can follow any responses to this entry through RSS 2.0. You can skip to the end and leave a response. Pinging is currently not allowed. 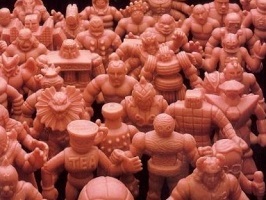 Auction Watch #65 - Interesting M.U.S.C.L.E. Auctions | University of M.U.S.C.L.E.